This Society was started in 1891 by Thomas Wells and Martin McDermott, J R S Richardson, Mrs Willis, and Jos Chambers. More keen members joined – W F Buckland, Miss Ewen, the Misses Sharkey, G B Simpson. They had a large marquee which they erected beside the Borough Chambers (later the old swimming pool / library / Sheffield Court). In 1893 the Waikato Times recorded that the blooms at this show were far superior than those exhibited last year. The Auckland growers were well represented and the contest between them and the local growers was keenly fought. 1,156 entries were received. Cambridge members were entitled to a supply of chrysanthemum plants from the society. Then all that was needed was a little labour and some quiet attention. Later Thos Wells undertook to grow 1,500 chrysanthemums, with the help of Miss Ewen and W F Buckland, so the society wasn’t obliged to supply plants to members. September 1905 Dr Roberts was the chairman and he added 3 guineas to prizes for the ladies, and Frank O’Toole and Elisha Veale donated half a guinea each as prizes for blooms grown by children. There were 411 entries and a show of 48 Japanese chrysanthemums and begonias by W F Buckland. The visitors were entertained by the local orchestra. In 1906 children were catered for with a floral design section. The Farmers’ Club combined their Root Show with the Chrysanthemums and the 428 entries included oats, wheat, mangolds and swedes. G E Clark & Co gave special prizes for produce grown from their seeds. W F Buckland took out the Champion Bloom at the Auckland Chrysanthemum Show but did not enter the Cambridge Show. The Chambers, Wells, Ewen and Sharkey families were to the fore when it came to best blooms. In 1908 the subscription was 5 shillings and about 1,000 plants were provided to members from Mr Wells’ garden. In 1910 the show was held in the Town Hall and the name changed to Chrysanthemum and Produce Show in order to include fruits and preserves categories. By 1911 W F Buckland was still in a class of his own with his begonias and added the cactus dahlia to his prize tally. Chambers, Simpson, Wells and Sharkey were still the names on the prize certificates. 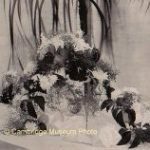 Floral arrangements were becoming a feature and Mrs H L Nixon took the prize for the bridal table. Wells and Buckland also took their fair share of prizes in the fruit and vege departments but P Williams and Mrs A L Souter were close seconds. By this time the society was pleased with the work they had done over the previous 22 years in fostering a love for flowers and providing gardens, both private and public, with chrysanthemums. Jos Chambers, one of the original members of the Society, stated that when the first show was held there were only three varieties in the district. Now almost every garden had a multitude of varieties. In 1913 two ladies were elected to the committee. The Governor and Lady Liverpool opened the show and the 3rd Regiment military band played for the show. (The first time a full military band had been in Cambridge.) But the show ran, for the first time, at a loss and they were anxious to increase their membership. The next year W F Buckland and G B Simpson grew the champion chrysanthemums and many competitors donated their blooms to be auctioned at the end of the show. Some of the prize money was donated and the ladies refreshment stall made a profit of £8. Both Dr Roberts and W F Buckland retired for health reasons. In 1917 G B Simpson, J Chambers and W Marks took nearly all the first and second prizes for chrysanthemums. Financially it was a resounding success and all the profits, £48 7s 3d, went to the YMCA Trench Comforts Fund. The next year there was no show because of lack of interest. Then in 1919 the show was abandoned because of lack of entries. At their AGM in August the society was disbanded and the funds divided between the Rose and Daffodil Societies. Today there is a Waikato Chrysanthemum Society which was formed in 1962 after the demise of the Horticultural Shows. Headquarters for the various Waikato flower societies are at Hamilton Gardens where equipment is stored and shared but the shows are separate.